A WELL-Conceived Concept Whose Time Has Come! A growing number of businesses offer endless supplies of healthy, fruit infused water drink options. Image courtesy of Death to Stock. Project managers, architects, and facility managers are always looking for workplace solutions that meet the changing needs of organizations. This process has typically involved plans to enhance the design of offices and buildings, and in this regard, LEED (Leadership in Energy and Environmental Design) has been an important certification program. But while LEED focuses primarily on the building, the WELL Building Standard places people’s health and well-being at the center of design. WELL was launched in 2014 following an extensive review of scientific research, evidence-based design, and best practices. It is certified by the International WELL Building Institute (IWBI) and Green Business Certification Inc., which administers the LEED program. In short, WELL takes a holistic approach by addressing behavior, operations, and design that promote healthy work environments. It is a performance-based system that measures the health of built environments according to seven features: air, water, nourishment, light, fitness, comfort, and mind. While WELL is still a relatively new concept, it is beginning to gain traction as more industry professionals and corporate real estate executives learn about its benefits and how it can be a wise investment. According to the World Green Building Council, staff costs account for up to 92% of business operating expenses. 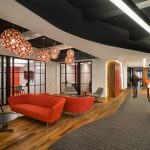 Increasingly, as part of today’s work-live-play dynamic, the office environment affects the recruitment of top talent; it can also improve retention, morale, and performance…all of which have important bottom-line implications. Indeed, more and more WELL projects are being planned locally and globally as tenants and building owners are weighing the potential rewards of a healthy workplace and well as the risks of inaction, including workplace fatigue, depression, and numerous physical ailments. Applying quality measures such as filtration and cleaning protocols. Testing and monitoring of public water to control additives and system contaminants. Promoting healthy food options, labeling, and safe food preparation and sourcing. Providing illumination guidelines to enhance productivity and visual acuity. Promoting physical activity and discouraging sedentary behavior. Establishing a distraction-free environment with ergonomic, thermal, and acoustic controls. Applying design and technology strategies to optimize cognitive and emotional health. Employees in WELL-certified offices report that their healthy work environments have added considerable value in terms of their happiness and well-being. Overwhelmingly, they say they are more engaged, more productive, and more inclined to collaborate. IWBI estimates that WELL-certified offices achieve a 22% increase in organizational performance. At the same time, employers report less absenteeism and turnover along with increased savings. There are now hundreds of WELL projects under construction. Looking ahead, McKinsey and Company projects that wellness will be the next trillion-dollar industry as organizations invest in healthy living programs and customers take more responsibility for optimizing their own health. Learn more. A good source is the International WELL Building Institute. Visit https://www.wellcertified.com/ and check certification guidelines, levels of certification, and available resources. Seek industry counsel. Ask your real estate service provider, project manager, or architect about alternative workplace strategies, including sustainability and wellness. Visit WELL-certified facilities. Ask about challenges and results. Ultimately, you want to align your real estate and business objectives. You want to plan ahead, which involves keeping up with industry trends and performing due diligence. What you may find is that what’s most important at the end of the day are the people inside the buildings.